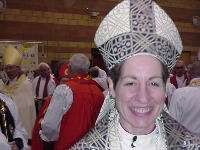 23 June 2006 — Bishop Katharine Jefferts Schori of Nevada, a licensed pilot and former oceanographer ordained only 12 years ago, became the first woman chosen to lead a branch of the Anglican Communion. Although the American church has been ordaining women since 1976, Bishop Jefferts Schori’s appointment as leader is controversial. She called it a sign that centuries of male-only leadership of her church is ending. “I think my election to this position shows that the bishops of this church are able to make decisions without regard to the gender of the person being considered, which is what we’re all hoping for, across the board,” she told reporters after her election. Only two other branches within the Anglican Communion – New Zealand and Canada – allow female bishops to serve officially. And there’s concern among both liberals and conservatives that issues of women’s rights and homosexuality could split the church. American church leaders appear to be listening to the conservative critics. Following her election as leader, Bishop Katherine Jefferts Schori joined in a successful vote to ask American Episcopal bishops and dioceses not to support future elections of openly gay bishops. The measure was a compromise, not an outright ban on gay bishops. But no one expects it to end either conservative criticism or calls from liberals for equality for women and gays. The struggle is not confined to Anglicans. Those who oppose female clergy, for example, often cite the tradition of male priesthood in the Roman Catholic and Orthodox churches. But Joan Clark Hauk, a grandmother from Pennsylvania, says she and seven other women will be ordained as Catholic priests in late July. Clark Hauk says the Catholic Church is wrong to exclude women from the priesthood. “I am asking the church to stop the sin of discriminating against women and blaming it on God,” she said. Episcopalian Bishop Katharine Jefferts Schori, meanwhile, is confident in her ability to persuade her fellow congregants that female leadership is a sign of progress. “I’ve discovered that once you build relationships, almost anyone will talk to you,” she says. She also believes she can further win new converts to the U.S. Episcopal Church, whose membership has been declining for years. Bishop Jefferts Schori, who is married and the mother of one, will be formally installed in her nine-year term as Episcopal Church leader in November.